Hen harrier numbers have fallen by 9% in Scotland since 2010, according to the latest national survey. The total population is now estimated to be less than 500 breeding pairs. The situation is even worse south of the border where the iconic bird of prey is said to be heading to the brink of extinction. The latest survey found 460 breeding pairs in Scotland in 2016 compared with more than 500 when the previous study was carried out six years earlier. The RSPB, Scottish Natural Heritage (SNH) and the Scottish Raptor Study Group, along with a range of other UK partners carried out the survey. 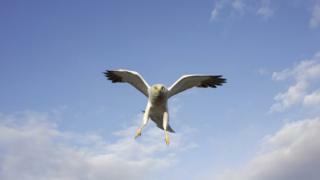 It found Scotland remained a major stronghold for hen harriers, with 80% of the UK population. However, having a breeding population of fewer than 1,000 birds makes the species vulnerable to the effects of habitat degradation and, in some areas, wildlife crime. The west Highlands continue to provide a home for the majority of Scotland's breeding harriers, while Orkney and the Hebrides were the only areas of the country to show a slight increase in the number of the birds. A major project aimed at maintaining their population has also been carried out at Langholm Moor in Dumfries and Galloway. Duncan Orr-Ewing, head of species and land management at RSPB Scotland, said: "The hen harrier is an indicator of the health of our upland environment, and the fact that its population continues to decline is of major concern. "The hen harrier is a high priority for our conservation work and urgent steps need to be taken to tackle illegal killing of this species and to improve their moorland breeding habitats." Eileen Stuart, SNH's head of policy and advice, said the decline was a "serious concern". She said they were committed to working with others to tackle wildlife crime throughout the country. "There is a very concerning trend of a long term decline in the number of breeding hen harriers in Scotland," added Wendy Mattingley of the Scottish Raptor Study Group. "For the population to begin to recover and expand over all suitable habitat, the intensively managed grouse moors of east and south Scotland must produce successful breeding hen harriers again. "The hen harrier is a wonderful spectacular raptor and more action must be taken to ensure that its future is secure." Tim Baynes, director of the Scottish Moorland Group, said the decline was disappointing but said it would be working to better understand the reasons behind poor breeding and help to rebuild the harrier population. Simon Wotton, lead author of the study, described the survey as a "monumental effort". "We hope these results will convince everyone in a position to help hen harriers to take positive steps to ensure their protection and rebuild the country's population for people to enjoy for generations to come," he said.